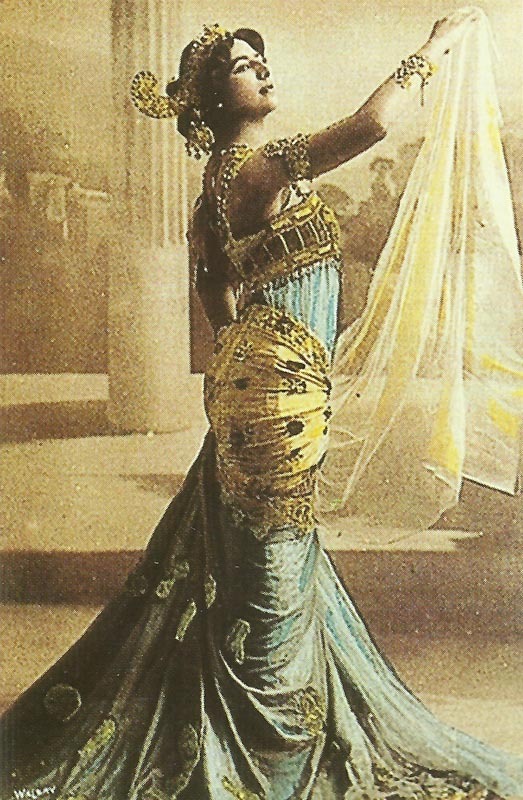 Mata Hari in one of her stage costumes. France: Mata Hari books into Grand Hotel, Paris, takes many military lovers but falls in love with Russian Captain Maslov during August. Verdun: Unsuccessful German attacks west of Hill 304. Brusilov offensive – Pripet: Austro-German counter-offensive until June 24. Marwitz’s 12 1/2 divisions gain only a few miles on river Stokhod against Kaledin (2,000 PoWs and 4 guns) for 40,000 casualties. Trentino: Italian counter­offensive until July 24 with 4 corps (177 battalions + 800 guns vs. 168 battalions + 680 guns) recap­tures Mt Magari and Cima Isidora (June 18). Cadorna decides Isonzo attack will aim just to take Gorizia. Arabia: 1,505-strong Turk Jeddah garrison with 16 guns surrender after naval and seaplane bombardment. East Africa: 5th Indian Light Infantry (400 soldiers) occupy Mwakijembe south of coastal border and Jasin on June 17. Belgians occupy Urundi capital Kitega (King submits on June 27). Channel: Destroyer HMS Eden sunk by collision with SS France.